Notice: Entry to the event and the site that it operates is expressly subject to acceptance by the visitor (includes campers) and exhibitors of these event regulations. “Event Site” means all locations owned, occupied or utilised to stage the Rally. “Event” means any event taking place at the Steam and Country Rally. 1. Permission to enter or to remain within the Event (notwithstanding possession of any ticket or pass) is at the absolute discretion of ROWSES officers or persons employed to ensure the integrity of event is maintained. On no account will admission to any Event be granted to any person not in possession of a valid ticket/pass. 2. ROWSES excludes to the maximum extent permitted by law any liability for loss, injury or damage to persons/property in or around the Event site. 3. No guarantees can be given by ROWSES that an Event will take place at a particular time or on a particular date and ROWSES reserves the right to reschedule the Event without notice and without any liability whatsoever. In the event of the postponement or abandonment of the Event, refunds (if any) should be claimed in accordance with the relevant Event organiser’s ticket terms and conditions. 4. All persons seeking entrance to the Event acknowledge ROWSES’s right to search any person, their vehicle and their belongings whether entering or inside the Event site and to refuse to submit to the search will result in person being refused entry or ejected from the Event. 5. Threatening, abusive or violent behaviour or using foul or abusive language or becoming drunk and disorderly is strictly forbidden and will result in arrest and/or ejection from the Event. ROWSES may impose a ban from the Event and possibly future Events as a result. 6 .Causing damage to, or interfering or tampering with or removing any exhibits, equipment or fixtures within the Event site may result in arrest and/or ejection from the Event Site. 7. Drinking from bottles is permitted throughout the site with the exception of the beer tent where only alcohol purchased within the confines of the beer tent can be consumed. 9. At all times whilst present in the Event Site persons must comply with any and all instructions of any security officer or officer of ROWSES and/or any Police officer. Failure to comply with any instruction may lead to immediate ejection from the Event Site. 10. Responsibility for minors (children under 14) remains at all times with a parent or guardian. 11. Responsible dog owners are welcome. Please keep dogs on leads and ensure you clean up after your dog. 12. Pre-paid camping is only available to TENTS and CARAVANS (not exceeding 24ft excluding drawbar) and cars or properly manufactured passenger-carrying vehicles. CAMPER VANS AND MOTOR HOMES must be properly manufactured. No articulated motor homes will be allowed. We are sorry but we are unable to allow VANS, LORRIES, PICKUP TRUCKS (open or covered), CREW CABS, UTILITY VEHICLES, MINI BUSES, BUSES or COACHES or any other type of commercial vehicle whether privately or commercially taxed onto the public campsites. Heavy machinery will frequently move around the site and any obstruction of access ways, exits and entrances, is strictly forbidden. ROWSES will remove obstructions as appropriate. Persons causing such obstructions will result in ejection from the Event. All vehicles travelling around the Event Site must conform to safe speeds limits and comply with normal rules and regulations that apply when using a vehicle on a road. Importantly, drivers and users of vehicles MUST observe instructions given by the ROWSES Officers, Marshalls and Security Staff. ROWSES upholds the highest standards of Health and Safety. On behalf of ROWSES, Health and Safety compliance is implemented by the appointed Safety Officer and enforced by the various Section leaders and Society Members. 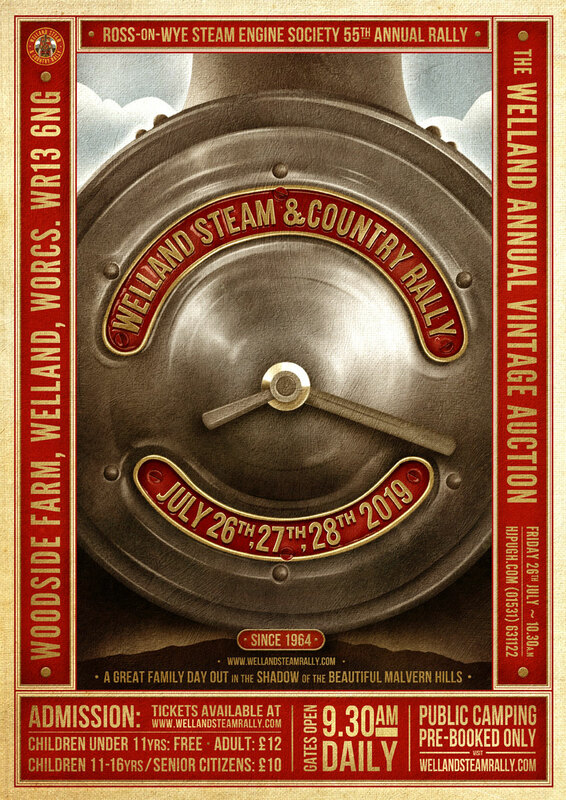 The Welland Steam & Country Rally 2019 Vintage Auction takes place on Friday 26th July at 10.30am and is hosted by H J Pugh & Co.
To celebrate our 55th Annual Rally, we have commissioned a commemorative A3, limited edition poster - available to buy exclusively at this years rally for £2.00. All proceeds to be donated to nominated charities. Lovely rally, something for everyone. Great buzz all weekend. Lovely event. With something for every one. To be honest. I think Welland Steam Rally is better than the GDSF. Fantastic craft and food halls!! Great atmosphere outside the beer tent with good entertainment. Great. Well organised event for all the family. Well worth a visit.